You Are Here: Home » Trip Planning » Gear » My Disastrous Experience with White Water Rafting! My Disastrous Experience with White Water Rafting! 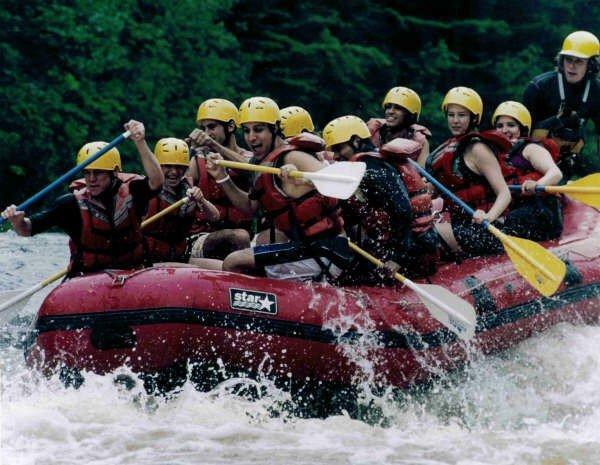 A while back, my friend planned a white water rafting trip for her birthday. Open to doing new things, I said yes in a heartbeat. Signing my life away on the site prior to embarking on the raft seemed like no big deal at the time. Oh boy was I wrong! As a previous competitive swimmer, water was my best friend. I practically lived in it so I definitely had no fear of it . I foresaw no issue with going white water rafting in la Riviere Rouge, a river close to Montreal. The day started like any other fun day. We all arrived at the site, laughed and joked about signing our life away before putting on our life jackets and heading to the water. As 9 of us got in the raft, I was sitting in the back near our guide. The water level were low that year due to a dry summer in the province so we were warned that it would be easier to get scrapes from the rocks at the bottom of the river. I didn’t really think anything of it because of the “It’s not going to happen to me” syndrome. So as we went off in the water, we soon reached the Bear currents (Mama and Papa Bear) where the Papa Bear was rated as a 4. If you’re not familiar with the current levels, the currents go from 1 to 5, 1 being a mild current and 5 being a strong current. So as we successfully went through the Mama Bear section, the Papa Bear was a different story! Since I was the last one to the right in the raft, I caught a wave and went flying into the water. I didn’t panic too much at first because I felt comfortable in the water. I felt comfortable until I realize that I was stuck under the raft! As I remembered to hold on to my paddle (as they explain before starting the adventure), I kept on swimming towards the light but unsuccessfully. In the meantime, I was in a current of a level 4 so I kept on tumbling until I went down this little hill under water and finally reached an area with minimal current. By then, I had swallowed a fair amount of water and I was indeed traumatized by the time I went back to the raft. My friends didn’t understand what I had just been through and having no option to go back to the site, I had to continue the adventure. Feeling uneasy, we then caught another small wave which made me fly off my seat but into the raft this time. I managed to hit my mouth with the paddle which caused me to have a swollen lip for the rest of the week! So as we continued the adventure, we finally reached the Washing Machine section, an area of the river that is known to make rafts flip over. At this point, I had the option of come off the raft. Did I get off? No… I figured, I made it this far so I’m going all the way! What a bad, bad decision! Half the people on my raft got off, which made us a lightweight raft. That is not a good thing when you need to overcome another strong current of 4 or 5, I cannot recall. And so, with only a few of us in the raft, out we went in the current. Only a few seconds later, our entire raft flipped over completely. All of us fell in the water. Most of the group was fine because they managed to swim over where the guides were. Unfortunately, myself and another person were stuck underneath a raft- again! This time, I was also stuck near rocks, which caused me to have scraped legs for the rest of the month. At this point, I was ready to accept death. I was lucky the first time but didn’t consider myself lucky enough to make it out alive a second time. While all these thoughts were going through my head, one of the guides turned the raft which allowed me to finally breathe. That was unfortunately followed by swallowing more water but I finally made it back into the raft alive. While all of this was happening, I had no idea where I stood. Watching the video of the adventure made me realize the situation I was in. As the tour we took included two runs, I decided to forfeit and accompany another girl to the hospital instead. This girl had a rock penetrate her leg so she needed stitches. I must admit that white water rafting will never be on my list of things to do again. While most adventures are positive ones, this one was definitely a negative one! Yikes! It does not appear to be a very safe company if they are taking newbies to a category 4 rapid. I bet you were very scared, but fortuantely you made it out of there without really needing to go to the hospital. Good story Tanya! But yes, I’m alive. It’s indeed something to celebrate!! What City Would You Rather Spend Christmas In?